Microsoft’s Surface Book and Surface Pro 4 both officially went on sale today, but they weren’t the only launch the company had planned for Monday: the company today cut the ribbon on its new flagship Manhattan store. Out of what was surely sheer coincidence, Microsoft built its store just five blocks away from Apple’s own flagship, so I decided to do a little tour of the Microsoft Store and compare it to the house that Jobs built. First, the similarities. Both stores feature a ton of devices placed on top of wooden tables, showing off the best of each company’s own hardware and accessories. 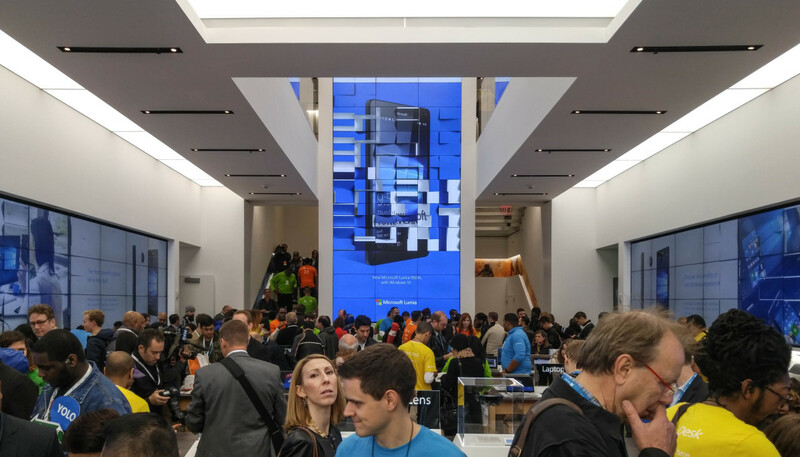 Microsoft’s Answer Desk is the counterpart to Apple’s Genius Bar for customer support, employees wear colorful t-shirts, and both retail locations occasionally hold public events. Now for some of the notable differences. Microsoft’s location may just be five or fix blocks away from Apple’s, but it doesn’t stand out nearly as much as Apple’s. The Cube juts out of an open square in front of the famous Plaza Hotel and is located at the corner of Central Park. There’s a reason it’s probably the most famous retail space in all of tech. The Apple Cube is an architectural highlight. Microsoft’s store, while flashy, is nestled in between other buildings in a slightly less prime location. The Microsoft store is nestled between two other buildings. The Microsoft logo is made up of four primary colors, and ever since Windows 8, Microsoft has used strong bold colors as part of its company identity; the Microsoft Store continues in that vein. While most of the walls are white, there are bursts of bright color everywhere, in particular the screens around the walls. There were also yellow and red shirts zipping around the store. While I’m a big fan of color, as a consequence the Microsoft store is missing a bit of the refinement and cohesiveness Apple’s stores always exude. The Apple Cube is an architectural showpiece; the Microsoft Store has a ‘cool’ factor to it, but it still feels very much like a retail space. For example, here’s Apple’s famous glass staircase. I can see your Halo? Microsoft’s store is made up of three floors, and each one of them has at least two sets of wall-spanning displays. Perhaps the most impressive of these is the one that runs vertically from the first floor to the second – it’s easily the most attention grabbing as it’s front and center when you walk into the store. There’s also a giant high-res display facing the street, which displays a variety of animations. 4) There are a LOT of third party products. This is the most fundamental difference between how the Microsoft Store and Apple’s operate. While Apple sells a ton of third-party accessories, the computers, phones, and tablets are all its own. It’s a closed system, after all, and only Apple hardware runs Apple software officially. The Apple Store is all Apple. Contrast this with the Microsoft store, which features many partner products as heavily as its own. While the first thing you see upon walking into the store are the Surface and Pro 4, immediately behinds these are collection of computers from manufacturers like Lenovo, HP, Asus, Toshiba, LG and Dell. In fact, Dell arguably gets a better showing than even Microsoft’s laptops, as Microsoft currently has the entire third floor devoted to a large selection of Dell products, from the tiny XPS 12, to hulking triple-screened Alienware rigs. Microsoft tells me it currently has a contract with Dell, but it’s safe to assume that space could cycle with other partners in the future. Not that Apple holds back on people using its computers – after all, someone recorded an entire rap album in an Apple Store, but the Microsoft Store was almost like a Windows fanboy playground. You can run through Xbox titles on the first and second floor, or play PC games on the super-powered computers on the third floor. You can’t do this at an Apple Store. The most interactive part of the Apple Store, meanwhile, was a 3D Touch demo with some fish. Fun. While the Microsoft Store is louder about trying to sell you products, it also seems like a much more fun place to hang out. Although Microsoft has had several stores in other parts of the world already, this is the first location in New York City. Like the Surface Book, it’s an example of the company taking on Apple by matching it in features, but adding its own little twists. Whether or not the store helps attract new buyers to Microsoft hardware and Windows 10 remains to be seen, but at the very least, it’s a cool place to play around with some new PCs and crazy rigs after you leave the Apple Store.